Review: Bond receives a cryptic message from his past which sends him on a trail to uncover a sinister organization. While Bond is on a mission M battles political forces to keep the secret service alive. Bond peels back the layers of lies to reveal the truth behind SPECTRE. We see Sam Mendes and Daniel Craig team up for the second time. Does this film live up to Skyfall? The answer is no but they are both very different. All the locations were incredible and it is hard to believe that they were able to get permission to film there. The opening sequence in Mexico is breathtaking and the car chases around Rome and along the River Tiber were astonishing. I personally enjoyed the scenes set in London the most. I don’t want to keep comparing both films but this is a more varied and playful film than Skyfall. Lovely to see more of Ben Whishaw; he rose brilliantly to the challenge of doing a bigger role. It was good to see Christoph Waltz as the latest Bond villain; his previous film roles have prepared him well for this part. However I would have liked him to be even more menacing. I thought it was very brave of Lea Seydoux to take on the role and thought she did a very good job. All the costumes were amazing so full marks to the wardrobe department. But one thing that did occur to me; how did they suddenly have smart clothes to wear, being as they spent most of the time being chased? The script was well written and quite funny at times, with some good one liners. Before watching Spectre one item in it that I wasn’t too sure about was the song by Sam Smith. However this song works superbly with the opening credits so I came out thinking how good the song was and how well it worked with the film. 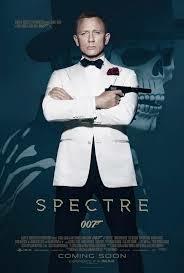 This is the most expensive Bond film ever to be made ($300m) and also the longest Bond movie at 2 hours and 28 mins. Even though this work was passed uncut from the BBFC it is understood that during post-production the distributor sought and was given advice on how to secure the desired classification. Following this advice, certain changes were made prior to submission. I almost forgot to mention the gadgets. There are plenty of them plus Aston Martin fans will not be disappointed. At the Golden Globe Awards in 2016 this won Best Original Song – Motion Picture. At the Academy Awards also in 2016 this won one Oscar and that was for Best Original Song (Writing’s On The Wall).